Look out for Iniva’s Emotional Learning Cards at this year’s Frieze art fair in Regent’s Park. Our Emotional Learning cards are part of the Frieze Young Peoples’ Programme led by artist educator Katriona Beales. Find excerpts of our cards within the Frieze exhibition guide and buy the cards at a special discount at the Frieze Tours Desk outside the Frieze auditorium. 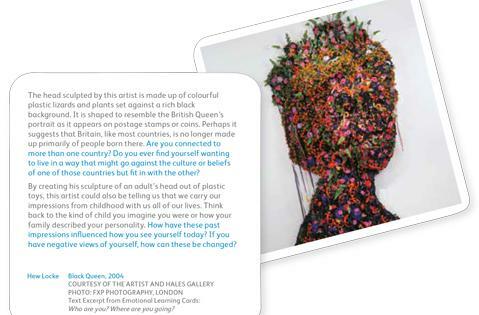 Emotional Learning Cards are an imaginative way of using contemporary art to support emotional literacy and creative exploration. Five different cards can be found in these booklets featuring artists Tania Bruguera, Yayoi Kusama, Hew Locke, Yinka Shonibare and Fiona Tan. Find out more via the Frieze website.